After our last lively feature discussion in april there will be another interesting one this friday. This time it will be in English again. The discussion is open for everyone to join. Looking forward to your contributions! The term ‘Critical Design’ appeared some twenty years ago in the design research community as a particular approach to human-machine interaction. Referring to a longer tradition of critical approaches in design and architecture, it was meant to re-establish alternative views on product and interface design, telling stories about human values and behaviour that were thought to be neglected in commercial product development. Since then, as a method, strategy, or theoretical perspective, it has been widely interpreted, appropriated, adopted, enchanted and criticized by design researchers. 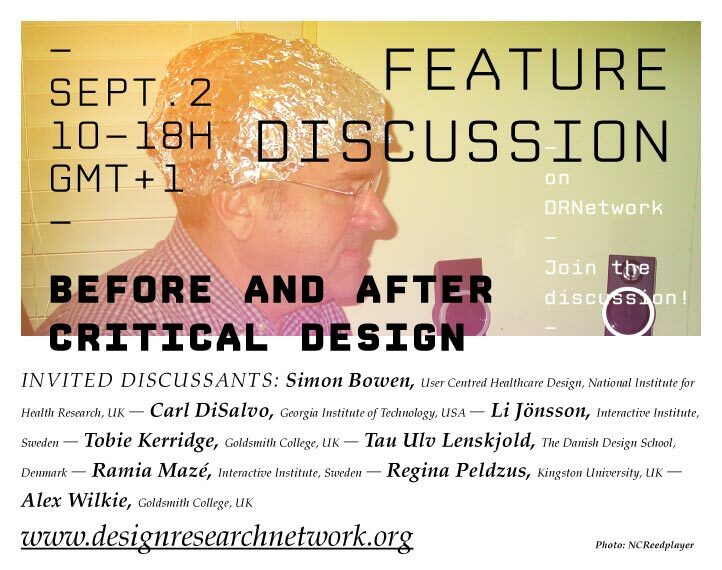 In this feature discussion, the participants will debate the role of Critical Design for design and research practice. The discussion is open to everyone. Please join! This entry was posted in Uncategorized and tagged Alex Wilkie, Before and After Critical Design, Carl DiSalvo, critical design, design research lab, Design Research Network, Designforschung, DRNetwork, Feature Discussion, Katharina Bredies, Li Jönsson, Ramia Mazé, Regina Peldzus, simon bowen, Tau Ulv Lenskjold, Tobie Kerridge. Bookmark the permalink.